The Miami Ink Tattoo shop was the site of TLC's previous hit show, Miami Ink. While the original shop has since shut its doors, the same tattoo artists are still working together to provide a great tattooing experience, at a new shop just down the road. The recognition from the Miami Ink television show created an incredible buzz for the now-famous tattoo shop, though both the location and name have changed. The shop was originally named 305 Tattoo, though thanks to the show's success it changed its name to Miami Ink. This location has since closed. Although the Miami Ink tattoo shop has since closed, there is no need to fear missing out on the Miami Ink experience; the same artists you loved to watch from the show have opened up their own lounge and tattoo shop right across the street. The new location is larger than the previous one. 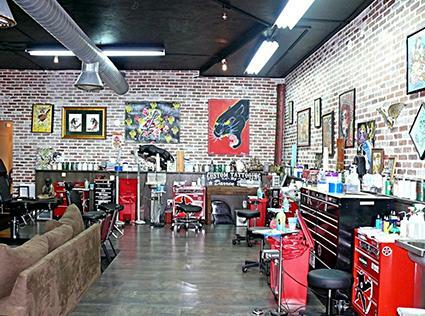 The artists needed a larger workspace in order to better suit the amount of clients they have been getting since the debut of the Miami Ink reality television show. The name of the shop was changed (for unspecified reasons) and is now called Love Hate Tattoo Studio. The Love Hate Tattoo Shop is located right up the street from the old 305 Tattoo shop, making it easy for old customers and new fans alike to visit the studio for tattoo art. The current address for the Love Hate Tattoo Studio is 1360 Washington Avenue in Miami, Florida. The studio is open 11 a.m. until 11 p.m. each day. 305 Tattoo, aka Miami Ink, became famous in the world of tattoo for one good reason - great artists. The work that the shop was (and still is) putting out was more indicative of fine art than what many people associated with tattoos before the television show brought recognition to the shop. Getting inked by artists that helped revolutionize tattooing is potentially a great thrill. Expect the cost of a tat from Love Hate Tattoo Studio to be top dollar, and be sure to call for an appointment before going. The shop handles many styles of tattoos from full sleeves and lower back tattoos to the very popular "urban" style. Whatever you want done, this talented group of artists can do it for you in a quality that you will be proud to show everyone.